Immerse yourself in the charm of Bakersfield by staying at the Four Points Sheraton. Located in Bakersfield Central on 7.5 acres of landscaped grounds, our hotel is within walking distance to nearby markets and shops. Ideal for both business travelers and vacationers, the Four Points sits within 5 miles of Rabobank Arena, Fox Theatre, Downtown Bakersfield, Buck Owens Crystal Palace, and the Park at Riverwalk. After exploring the area, relax in our spacious guest rooms, all offering our Four Comfort Beds. Take a dip in our outdoor swimming pool, or keep to your workout routine in our fitness center. Enjoy award-winning cuisine at The Bistro Restaurant & Bar. 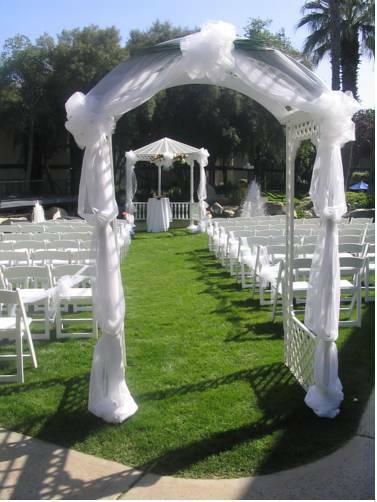 Outfitted with nearly 7,000 square feet of space, our hotel is also the premium choice for business functions, weddings and special events in Bakersfield. Bistro: Exceptional food and impeccable service make Bistro the perfect destination for intimate romantic evenings or entertaining your corporate clients. Enjoy expertly created culinary masterpieces complemented by exquisite wine selections.